I have never done so much research on a country in my life until the few days leading up to my journey to Myanmar, and because most of my friends and family know nothing of this underdeveloped country, I want to share my brief knowledge of this country before I dive into my photos and experiences. 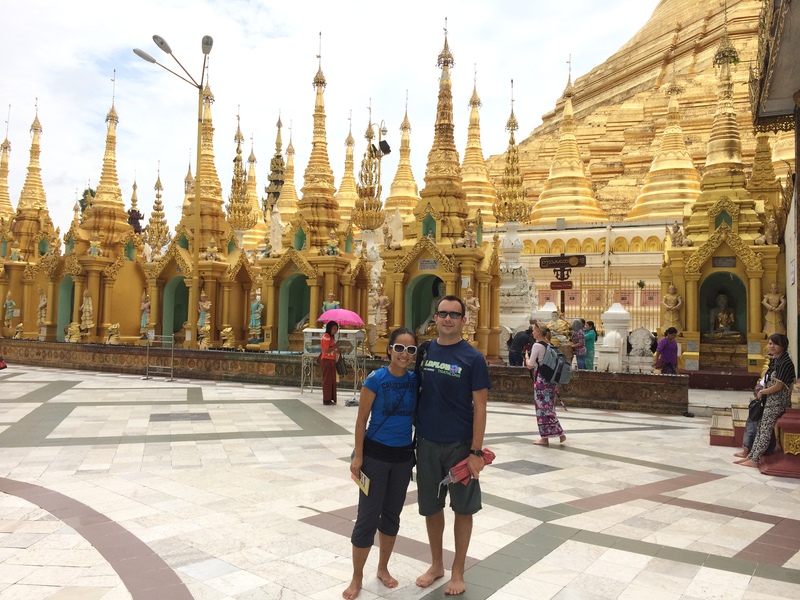 Responsible tourism takes on a new meaning in Myanmar. Previously I have only heard that term with regard to drugs and alcohol. People advise against partying late and getting too wasted in foreign countries, trusting strangers, and wandering in unfamiliar neighborhoods. 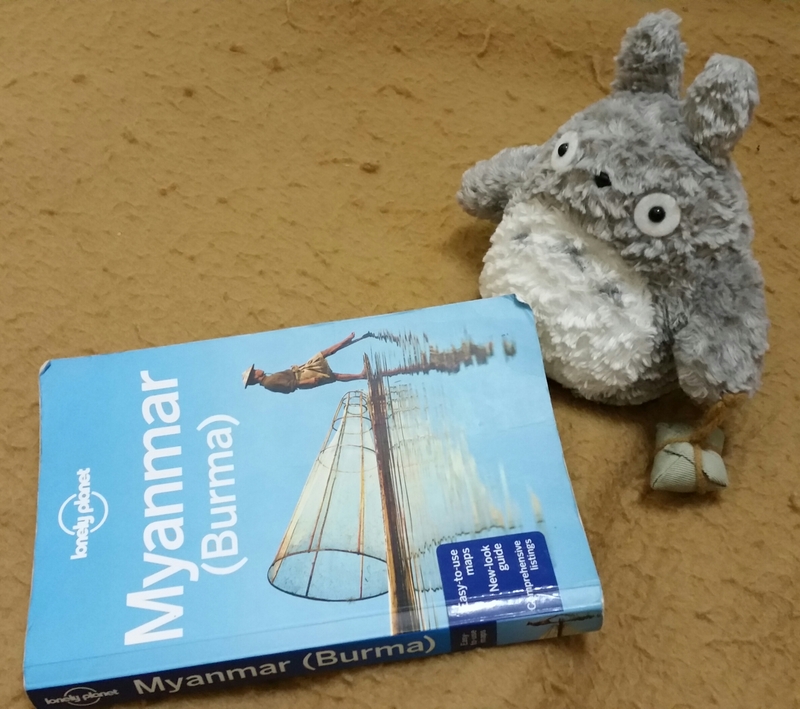 In Myanmar, once the meaning of “traveling responsibly” is explained one is left slightly disheartened and perhaps even may reconsider a visit to this country. To travel responsibly would mean to avoid funding the government, one of the most corrupt governments in the world. Like North Korea, the government of Myanmar isolated itself from the rest of the world, spiraling into economic downfall. However, unlike North Korea, its isolation lasted approximately 30 years from the 1960s to 1990 and is now seemingly making strides toward democracy. Propaganda is not on every corner, and people are generally free. Though not a totalitarian dictatorship, the government is still known for its media censorship and lack of human rights, and citizens are not permitted to speak freely or even roam freely in their own country. Bloggers are known to be jailed, and thousands of political prisoners from the past remain incarcerated. 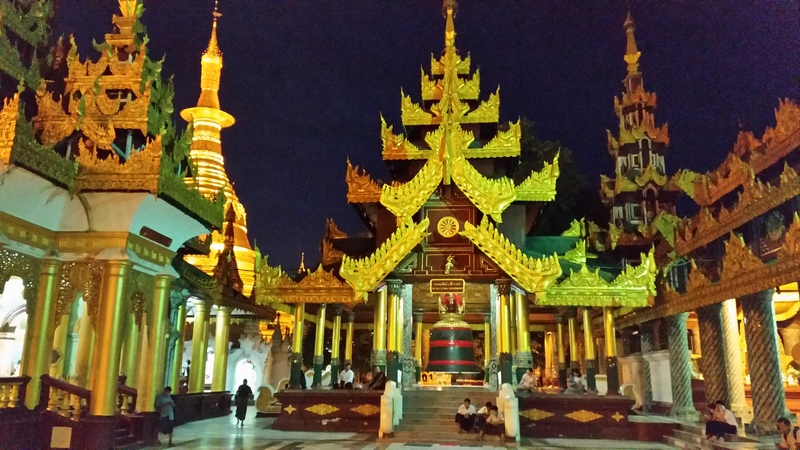 Everyone says the people of Myanmar are especially kind and correlate that with their religious ties to Buddhism. While I agree that the locals are genuinely welcoming, I must point out that their Buddhist government is unfortunately not. Over 80% of their country is Buddhist, and that includes Buddhist mobs and monks who instigate hate crimes and civil wars against Muslims. Discrimination against non-Buddhists is severe; non-Buddhists will never be able to earn a high-paying job in Myanmar. Civil wars and hate crimes including the ravaging of Muslim mosques are ongoing not just in villages, but also in large cities such as Mandalay; a curfew in Mandalay was declared only recently on July 3 due to Buddhist violence against the Muslims. Even more shocking is the government’s intent to drive the minority Rohingya minority group to extinction. The Muslim Rohingya minority group live in the far west of Myanmar along the border of Bangladesh. According to the Myanmar government, they are not citizens of Myanmar despite the fact that their families have lived there for generations. As a result, they are considered stateless, have been denied citizenship and their rights, and have been put into camps (I call them extermination camps) where they are not permitted to leave. The government denies them basic aid and food, spreading unnecessary starvation and diseases that could easily be prevented. According to the United Nations, they are one of the most persecuted minorities in the world. Even the majority of the Rohingya who manage to flee to Bangladesh or Thailand barely survive their journey and face the high likeliness of capture and imprisonment. With the current political issues being said, it is also important to highlight some recent key historic points. Up until 2011 Myanmar was ruled by decades of isolation from the rest of the world under the military junta. 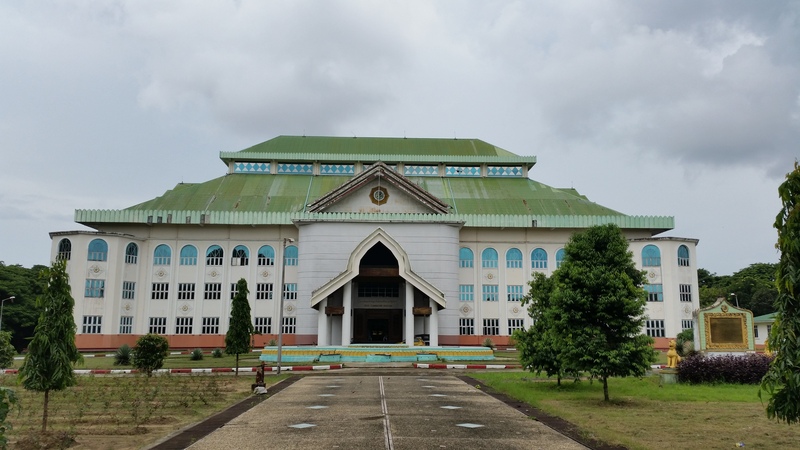 The recent declaration of independence from the British in the 50’s led to the renaming of the country (from Burma to Myanmar), and the recent downfall of the military junta led to the renaming of the former capital (from Rangoon to Yangon), and even the birth of a new capital, a city built from scratch, Nyapyidaw. 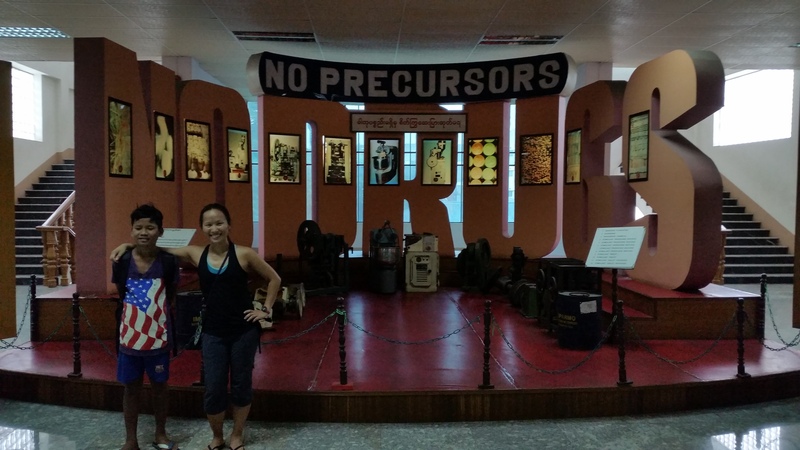 Prior to 2012 the door to Myanmar tourism was barely an open crack, but the softening of the tourism boycott in 2012 vastly opened its doors. Despite not being ranked far off from Cambodia and even Somalia in terms of government corruption and poverty, Myanmar is surprisingly ranked high in safety. The people of Myanmar are kind to foreigners because there aren’t many of us there yet; they are curious about us, and are happy to learn that internationals are eager to learn more about them. Tourism in Myanmar is now on the rise, especially by those hoping to see the most “untouched, rawest” country in Southeast Asia. In 2012 there were over 1 million tourists in Myanmar, a 67% increase from the year before with only 816,000 visitors. Compare that with the 26.7 million visitors to Thailand in 2013! It is incredibly fascinating to know that the neighbor of a once-isolated country is the world’s top destination. Myanmar is struggling to keep up, but its transition from an isolated identity to international reform makes it an exciting place to be in. 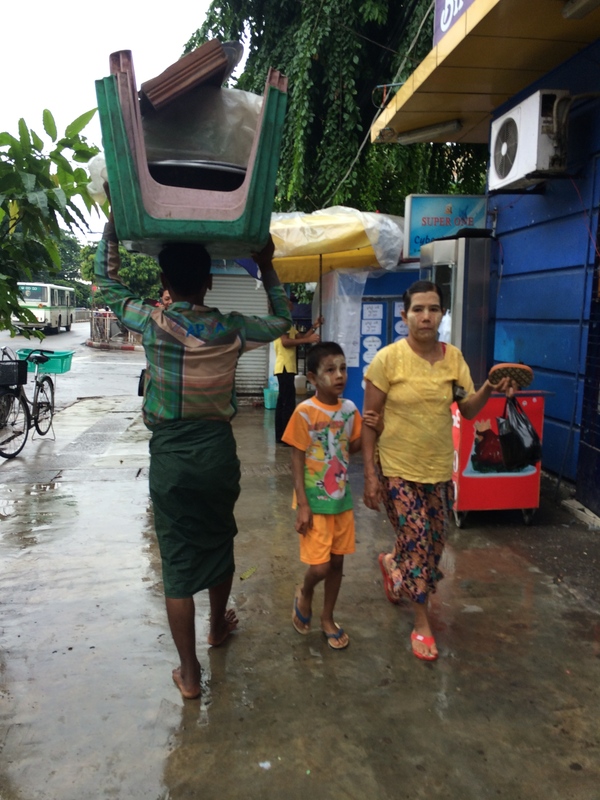 Only a year ago Myanmar saw its first handful of ATMs and now they can even be spotted in small towns. 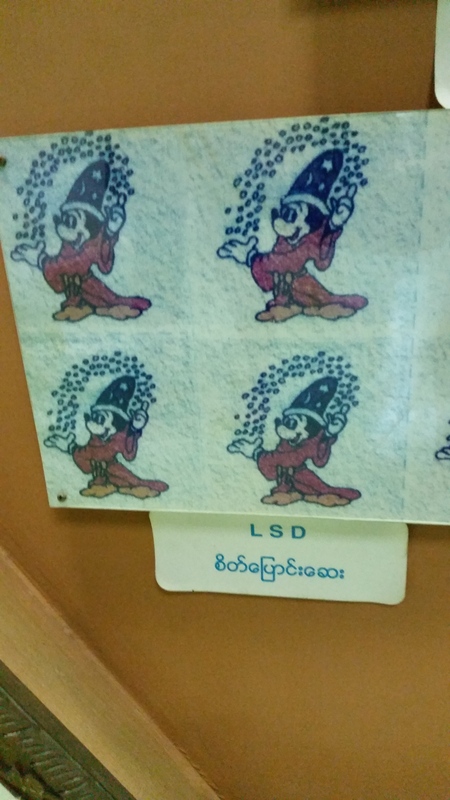 For now, the people of Myanmar continue to have a virgin eye for foreigners. 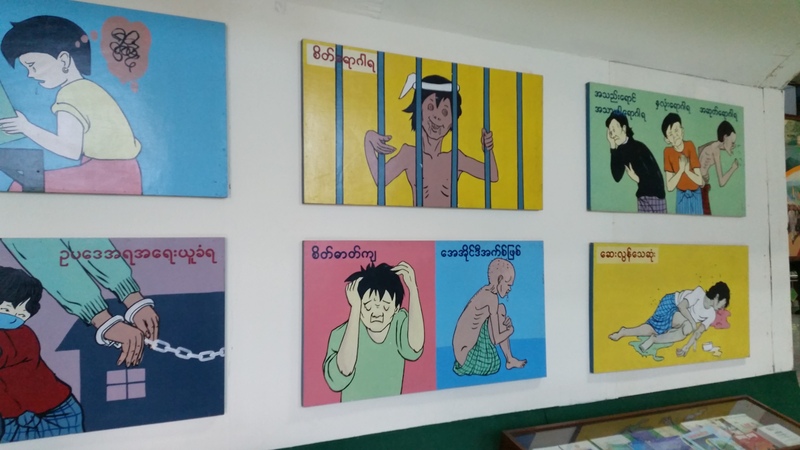 Contrary to its Southeast Asian neighbors, most people in Myanmar have not yet learned how to scam foreigners, stalk them in tuk-tuks, or sell them t-shirts with amusing cartoons and phrases. My guess is they will learn to hate us (like the Vietnamese do!) in the next generation. Although still considered filthy by Western standards, its Southeast Asian neighbors make a minor attempt at litter removal due to their knowledge of trash-despising visitors. 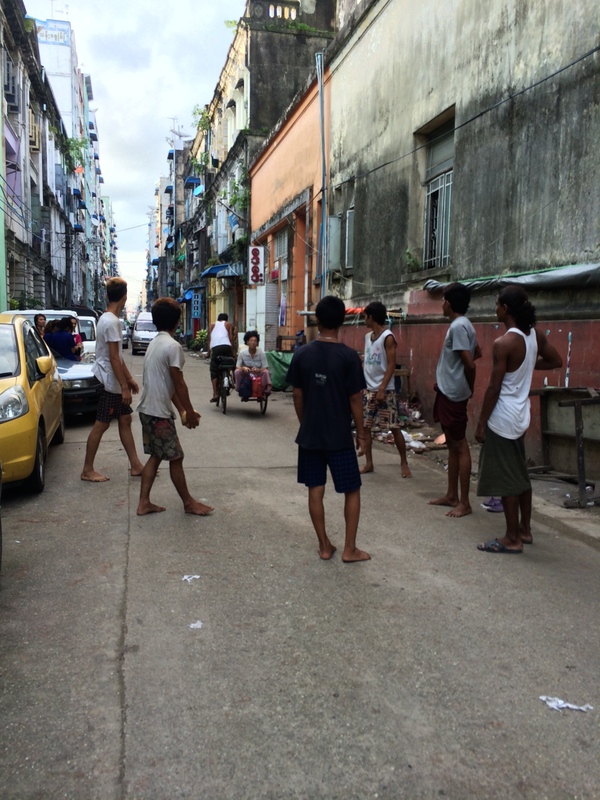 With so little visitors, the Burmese have not yet felt the need to properly dispose their garbage. 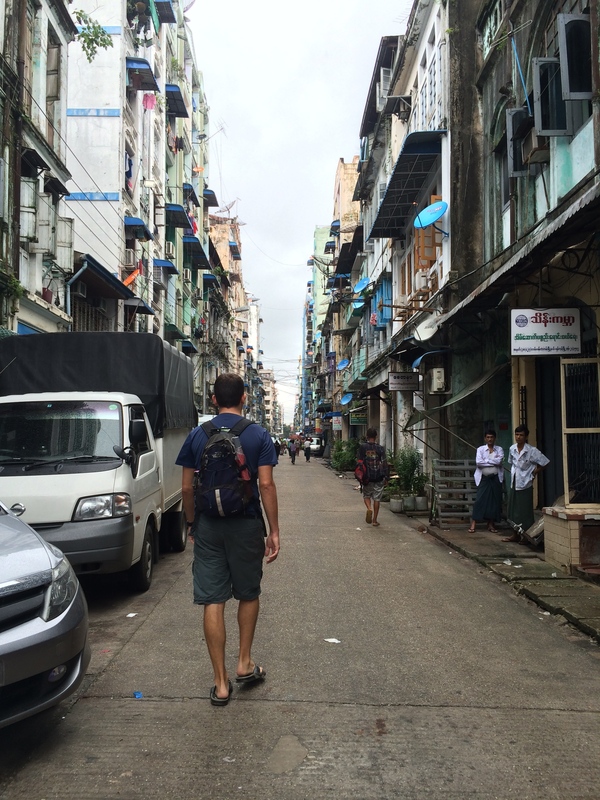 As a result Yangon has the grimiest, filthiest streets I have ever seen. Mud, plastic bottles, bags, and wrappers are the least of my concern; crumbled sidewalks, gutters filled with brown rainwater and sewage, puddles of rainbow oil slicks, loads of pigeons and their poop, and crimson blood-like splatters of betel nut spit stain the sidewalks and streets. 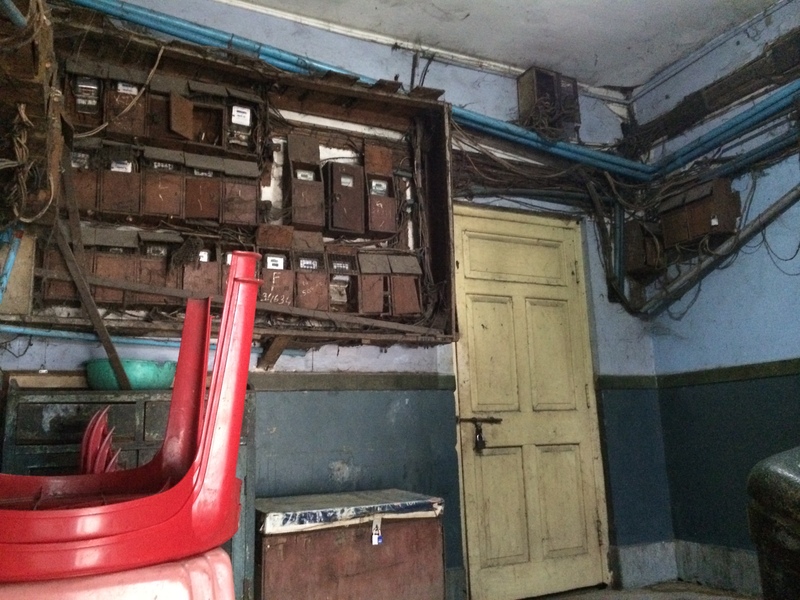 Add the rumbling of generators for periodic blackouts and spattering, black smoke from the decades-old buses and you now have Yangon before your eyes. Geographically Myanmar belongs in Southeast Asia, but culturally it feels more like its neighbors of Bangladesh and India to the west (which I’ve had the pleasure of visiting four years ago). 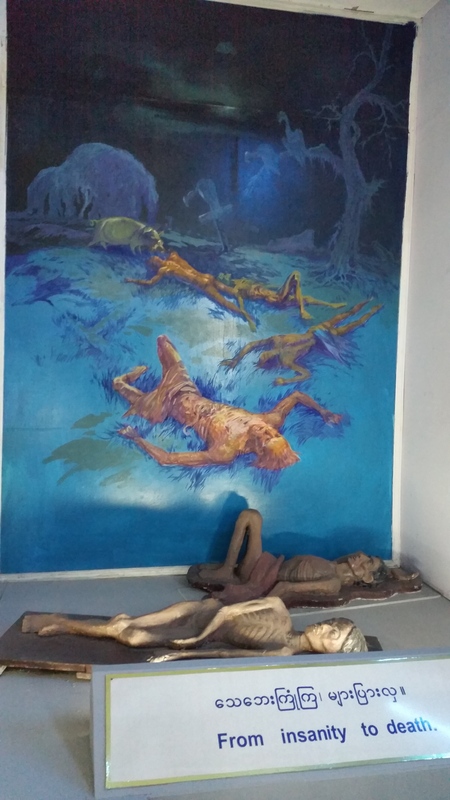 Despite our centrally located guesthouse (Golden Star Guesthouse) in downtown Yangon boasting high reviews, the entrance and stairway leading to the guesthouse was gruesomely gritty. First, you have to pass the ancient electrical boxes covered in grime. Then you have to walk through someone’s kitchen (only around meal times). And sometimes the kitchen transformed into a laundry area, with the pet cat lounging about. 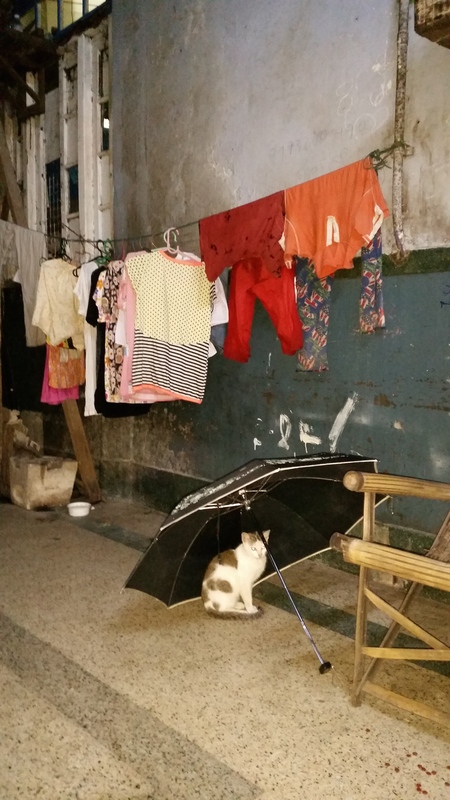 And finally, you had to walk past this man’s “home” every morning and evening. 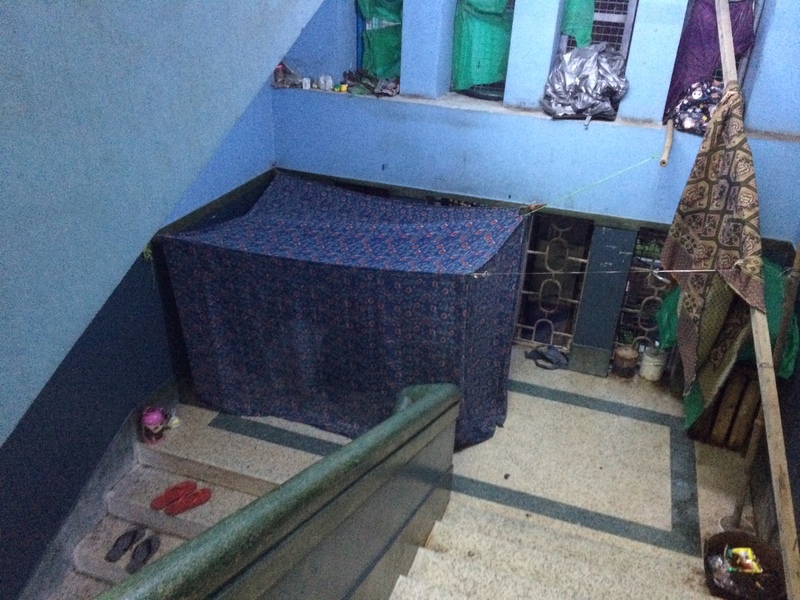 His belongings included a straw mat and a mosquito net, and he was usually gone midday. 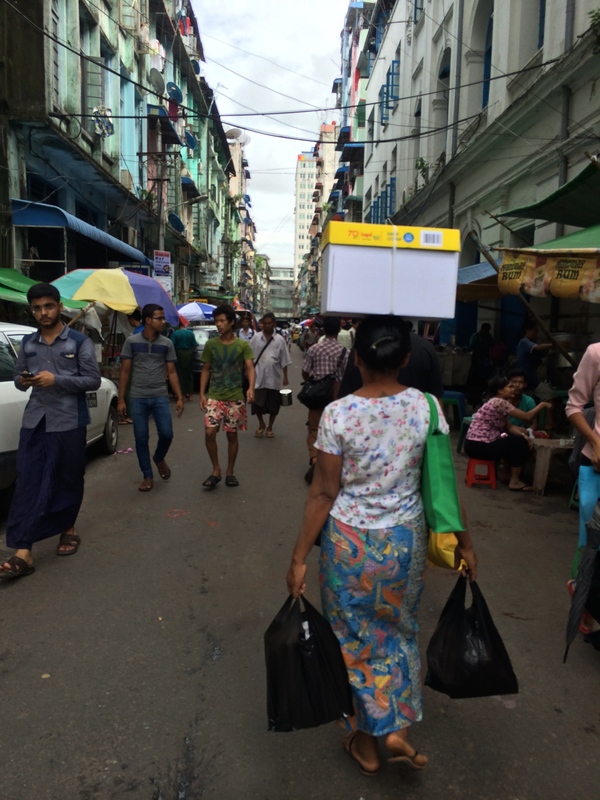 In the former capital of Yangon, home to over 8 million citizens, people seem to live their lives the way the rest of the Southeast Asians do, crowding the poorly built streets filled with fruit stalls, street food vendors, and miscellaneous junk. Unlike other Southeast Asian capitals and major cities, motorbikes are strictly prohibited in this city, creating aggressive drivers in gridlock traffic. People drive on the right side in Myanmar, even when most of their vehicles have steering wheels on the right. 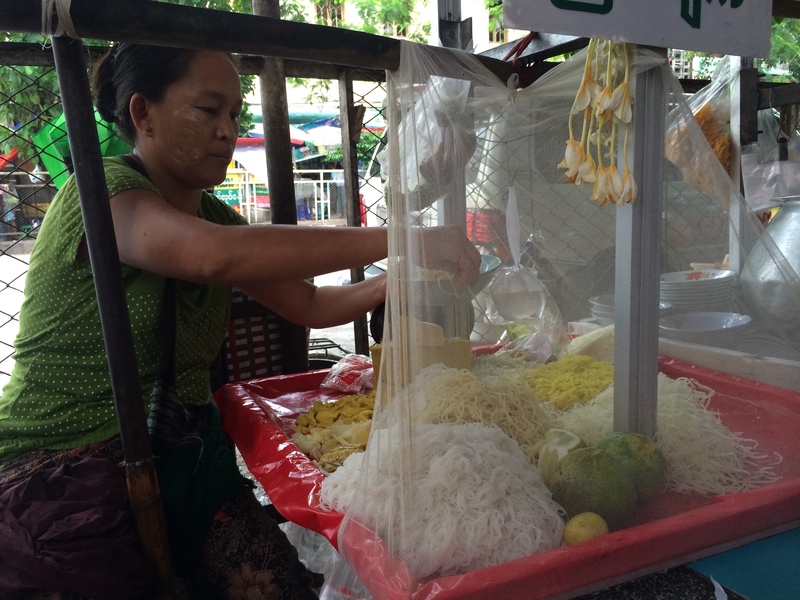 Food vendors line the sidewalks with tiny plastic tables and chairs, serving the scrumptious national dish of mohinga soup and shan noodle soup. Thanks to the rise of tourism, Yangon hotel rooms are more expensive but much more subpar compared to other Southeast Asian countries, but their food remains inexpensive and absolutely delicious. 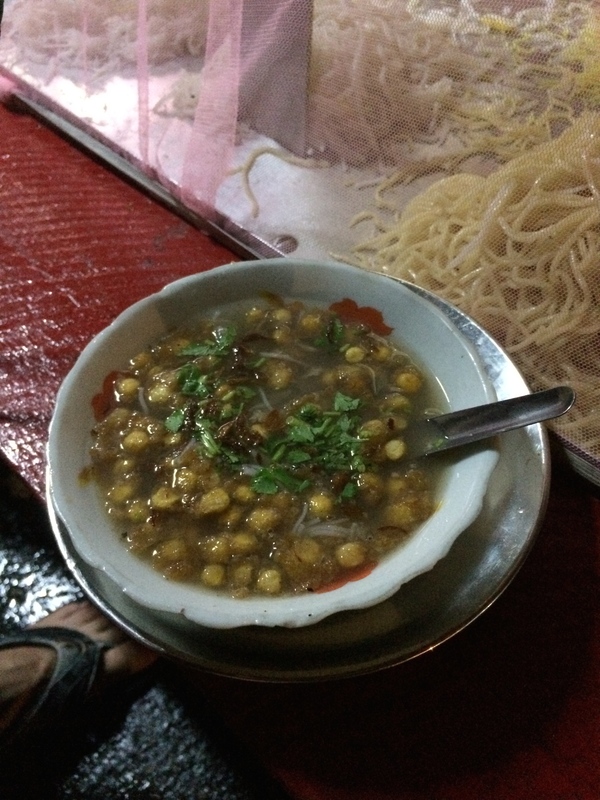 Small bowls of mohinga are anywhere from 200-400 kyat (~0.30 USD), but my highly sought-after snack is the fermented tealeaf and fried nut salad, laphet thoke. 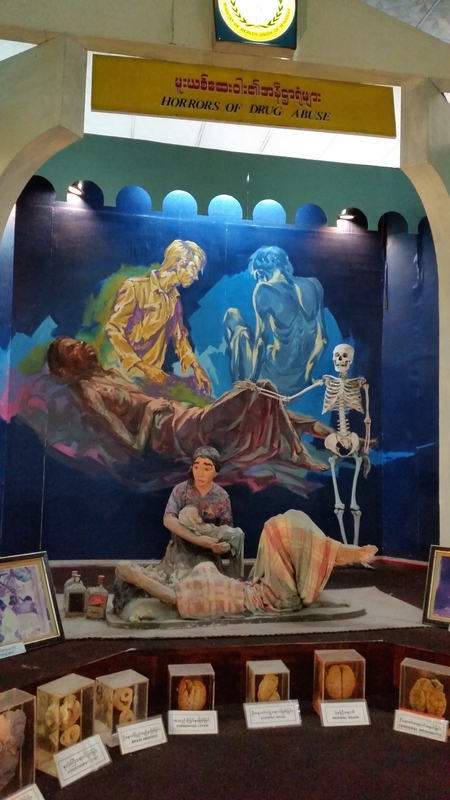 A handful of Yangon’s citizens have migrated over to the Western clothing of jeans and colorful t-shirts, but the majority of men and boys continue to stroll in their longyi while the majority of women wear their traditional colorful sarongs with thanaka painted on their faces. 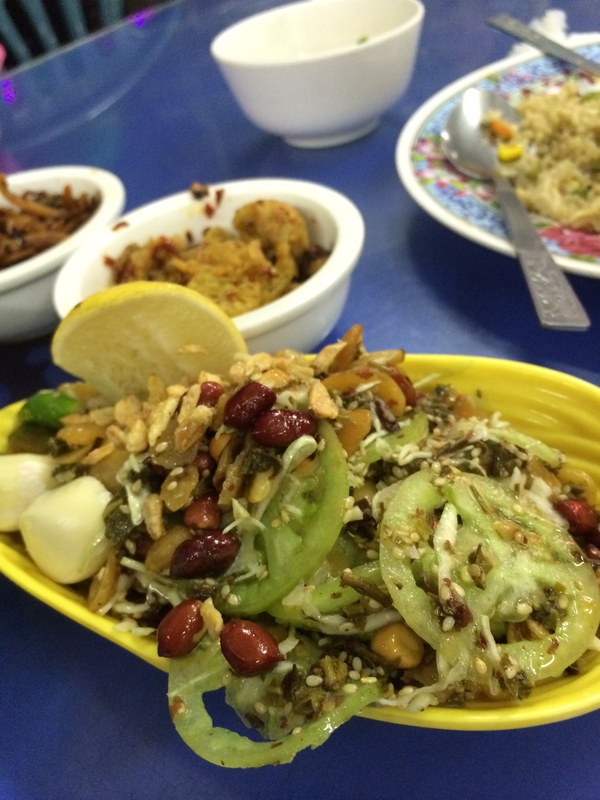 A Hindu and Muslim presence is strong in Yangon as seen in the kufi the men and boys wear, the number of Muslim restaurants, and the fresh samosas frying on the sidewalks. Foreigners have a bit of a presence, but nowhere near to the extent of the other Southeast Asian countries we have visited. 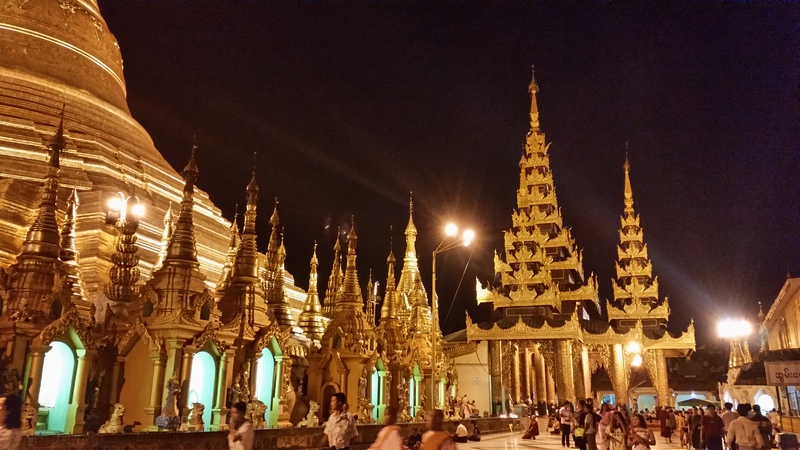 Mass tourism has not yet destroyed Burmese culture, but with the rapid growth of tourism Myanmar might be sorely transformed within a few years. 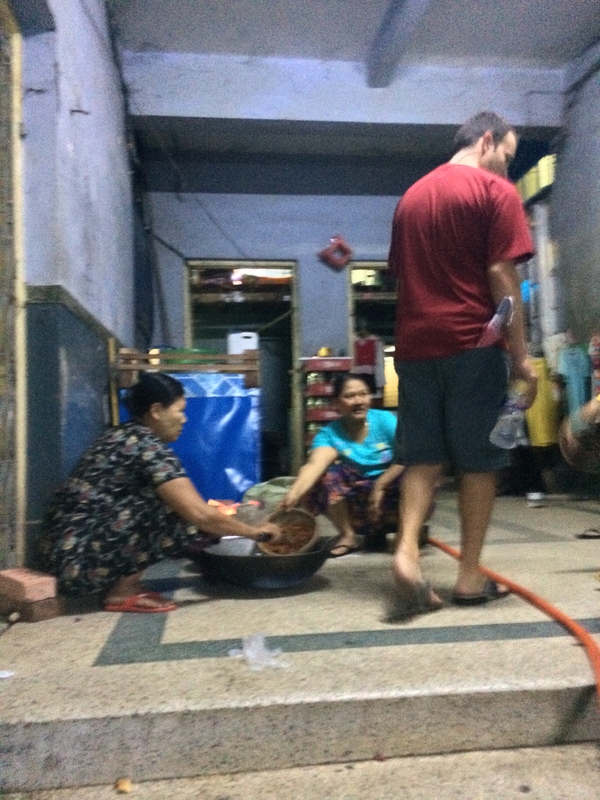 July 4th marked our first full day in Yangon. 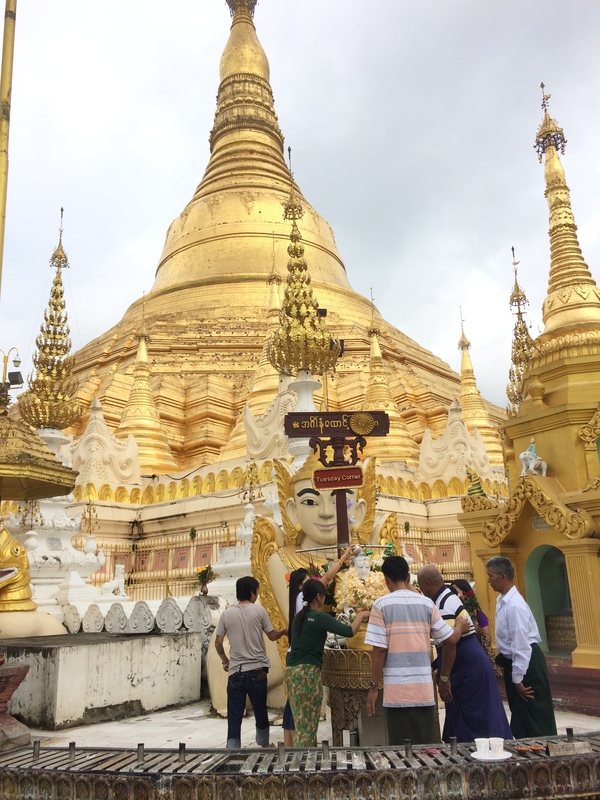 Instead of taking a taxi, we chose to explore the 4 km from our downtown hotel to the Shwedagon Pagoda, the most sacred religious site in the entire country. Prior to arriving, it was easy for me to assume that this would be “just another religious site,” despite knowing about the copious number of Buddha statues, pagodas, stupas, shimmering gold, and temples it contained. It is said that there is nowhere else in the world like it, and after gazing at the spectacular site, I must cave in and agree. This place was HUGE. It was also beautifully spread out. 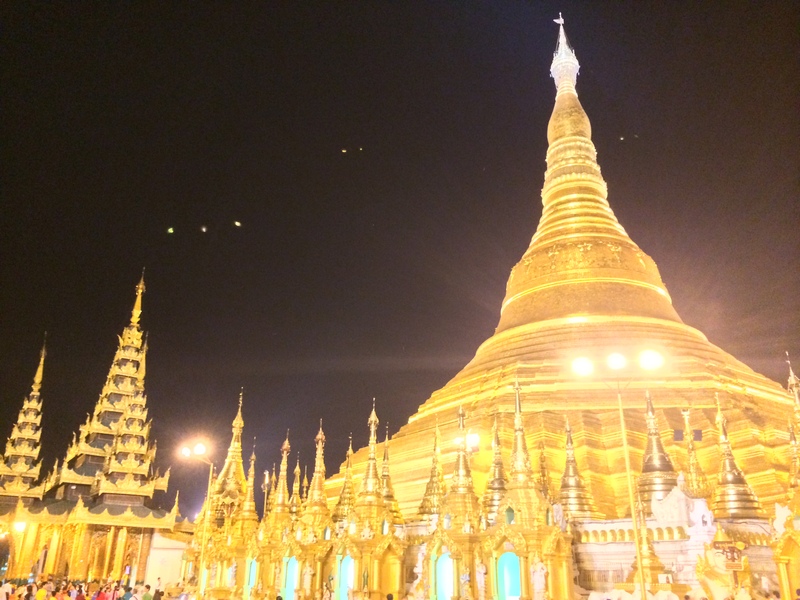 Not all Myanmar people are able to travel, and when they can, a pilgrimage to the Shwedagon Pagoda is a lifelong dream fulfilled. It’s a pagoda, it’s a temple, it’s a museum, it’s a people-watching site, and it’s a hangout spot for locals. 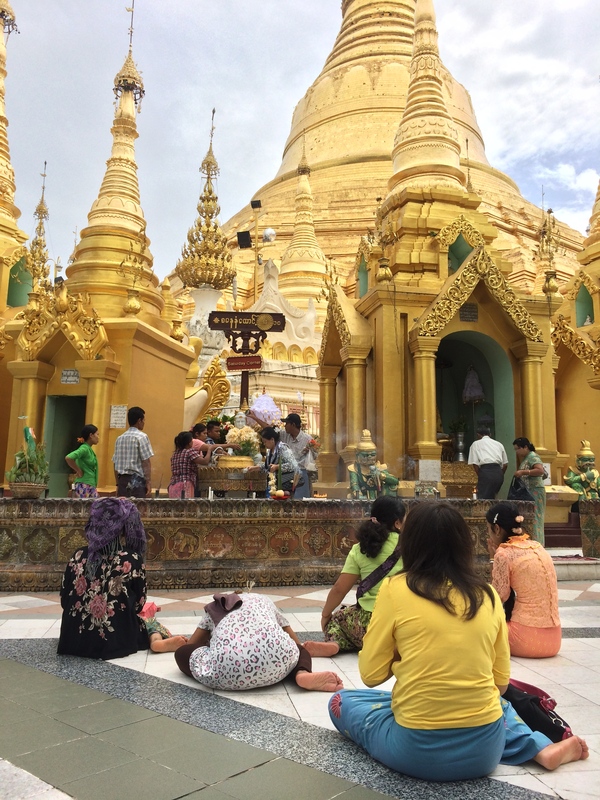 Teens gather in cliques beneath shaded structures to take selfies, while groups of monks and locals monotonously chant their prayers as the ring of a gong echoes in the distance. As the robotic chanting continues, one can feel the eerie power of faith penetrating in one’s soul. Our 1-day pass was valid for the entire day, thus we returned in the evening as it was recommended for a fantastic photo opportunity. 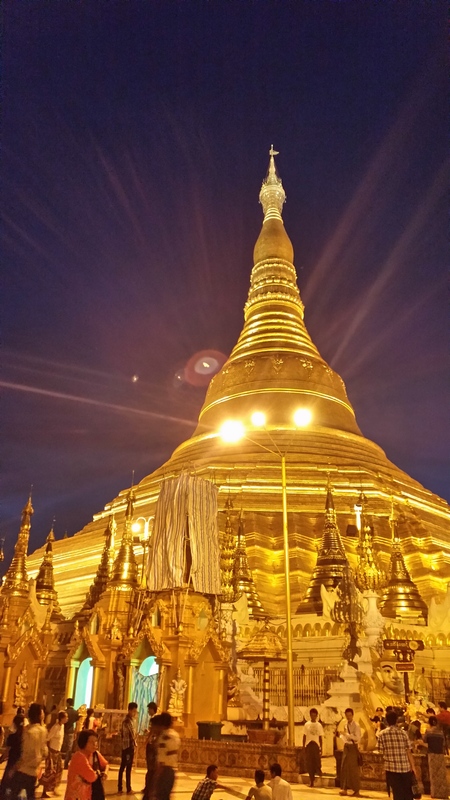 During the day, the pagoda’s pure gold and diamonds shimmered in the sunlight, and during the evening the carefully staged array of lights proudly illuminated the pagoda against the backdrop of a starry night. We did not observe a fantastic firework show for our Independence Day, but we enjoyed the dazzling presence of Myanmar’s holiest site. 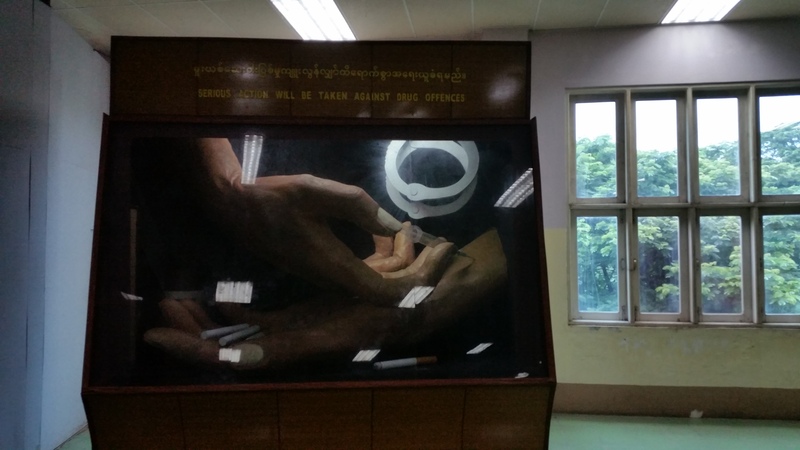 Between our day and evening visits to the holy site, we humored ourselves in the afternoon by visiting the Drug Elimination Museum. It is unnecessary for me to elaborate on how ridiculous this place is as it is wonderfully described in this article, so I will simply share some of our ridiculous photos here instead. Some photos inside. This kid followed us around. Apparently all foreigners are followed around by a staff member of the museum. Big Brother watches you here…oooooh scary. On a separate day, I searched for the conversational English-speaking class that a friend recommended to me. Chris wasn’t feeling well, so I went alone and found myself in the afternoon class of U Aung Hein Kyaw’s on 167, Seikkanthar Street. Upon a scan of the large classroom filled with students ranging in all ages, I quickly discovered that I was the only English-speaking foreigner and to my surprise, U Aung sat me on a stool centered on a small stage in front of the entire classroom and handed me a microphone. For the next two hours, students passed around the microphone so everyone (who was not shy) could ask me questions about who I was, what the U.S. was like, what the rest of Southeast Asia was like, etc. Throughout the conversations I jokingly prodded each student to sing me their national anthem and to my astonishment one guy actually asked the whole class to stand up, and together, they sang for me their national anthem! The majority had their hands at their sides, with their heads slightly bowed, as they respectably sang their nation’s pride. For some reason I was incredibly moved and the fat smile across my face fought back tears. I thought I was done after the two hours on the stage, but U Aung immediately asked me to remain another hour to help a smaller group with their English. His tone of voice and lack of other foreigners made me feel as if I did not have a choice, so I remained and ended up chatting for another two hours. Because this group was so small and personal, we were able to share more meaningful conversations about business and culture. Thrilled with this experience, I returned again the next day, our final day in Yangon, for a morning class (with Chris this time). Later that afternoon after 5pm, we boarded a large bus en route to Kalaw. Despite us being the only foreigners, it was probably the best bus experience I’ve ever had in Southeast Asia, even with the annoying Burmese music videos and poorly produced movies playing on the television. The locals were incredibly nice, especially the people who worked in the bus. Even the driver was not a maniac like a Vietnamese driver. Each seat provided a blanket, pillow, bottle of water, toothbrush, and toothpaste. We arrived at our destination just a quarter ‘til 3am. Yangon was long behind us and I couldn’t wait to get a glimpse of the rural Myanmar in the mountains.